Our team answers homeowner questions every weekend on WCCO 830 AM from 9:00 am-10:00 am. Have your most pressing home improvement questions answered by calling 651-989-9226 or texting 81807. Here’s must-know information from Barry Stranz (professional & educator) who has 30+ years in the home improvement industry shared on 11.3.18. If you’re building a new home or remodeling, it’s vital that you work with a reputable contractor that has a working knowledge of building codes, as home building envelopes are tighter now than in years past. By definition, a building envelope is the tangible barrier between indoors and outdoors. A reputable contractor will comprehend that excessive home humidity levels can lead to mold growth, wet basements, floor movement, and foundation cracking. This working knowledge will ensure that your home has adequate levels of moisture, keeping your family safe and your energy bills in check. Proper diagnostic tools such as humidistats, blower doors, and infrared imaging provide contractors a clear understanding of the tightness of the building envelope. Historic Homes: Double hung windows, which are opened through an up and down movement were the go-to window in historic homes. This forced HVAC systems in historic homes to work harder because of higher air infiltration ratings of double hung windows. In older homes, interior water vapor can disperse outdoors through window and wall air leakage. Solid wood created gaps in the outside sheathing, allowing air to easily move throughout the home. This scenario created a looser envelope than is commonly found today. Modern Homes: Nowadays, homeowners are gravitating towards casement and awning windows, which open outward. A benefit to these two styles is that they do not work against their weather-stripping to seal, making them much more energy efficient than double hung windows. 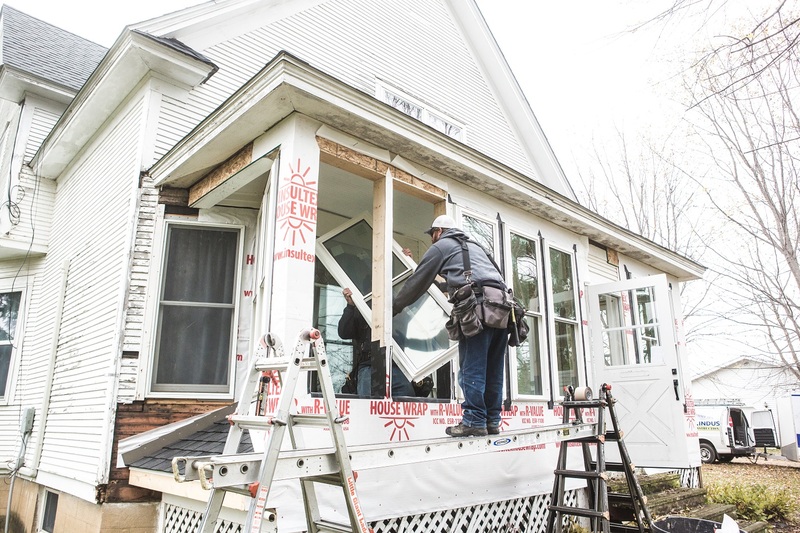 As casement and awning windows gained popularity, homes began to be built tighter. However, if the home building envelope is too tight, moisture issues ensue. Modern conveniences, such as spa bathtubs and dishwashers contribute to higher ambient home moisture levels. These days, wall systems act less like the lungs of the home than past configurations. This means that if water is let into the space in the winter months, vapor that comes in contact with the OSB or plywood used in today’s homes can lead to frost. To combat this, many contractors began the use of plastic sheathing on the inside surfaces of walls to act as a vapor retarder. This approach creates a tighter home.